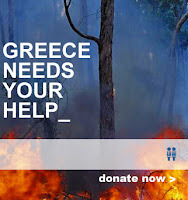 Under the [Greek] Olive Tree: Greek Fire Relief - Now is the Time to Help! The past few days we've all watched in horror as cruel fires have ravaged our homeland. As we anxiously reach out to family and friends in hope that the effects are only material, many questions, frustrations and theories have come forth. - Who is responsible for these fires? - Why can't authorities be closer to areas of need? - How can citizens be better equipped? - How do we make sure this never happens again? 1.) Contribute to the national fund created by the National Bank of Greece. You can do this by directly access the account info or by donating via PayPal, which was quickly mobilized by DailyFrappe. 2.) Contribute to the Greek Red Cross. The Red Cross, or Erithros Stavros, quickly dispatched both volunteer rescuers and medical personnel throughout the country to aid efforts. In addition to monetary donations, click here for a list of specific items they need to provide to their teams on the ground. 3.) Reach out to your local AHEPA chapter, most of which are collecting items and money for care packages to be sent to the affected areas. Most Greek Orthodox churches in the U.S. can help direct you to the local AHEPA efforts, which will likely be aligned with the church. 4.) Join the "Plant Your Roots in Greece" campaign to help mother nature come back in full force. With as little as $10, you can help plant a tree. Of note, it is important re-plantation is done by professionals as only specific types of trees can survive and help the scorched land. This, thankfully, is only a small sampling of the humanitarian help being organized. Additional fund-raising efforts will be posted here, as well as on DailyFrappe... so please check both sites! Also, please contact me at undertheolivetree@gmail.com to let me know about any activities you are organizing in support of this effort for more help in getting the word out. In addition to posting on this site, I am happy to extend information to other social networks and media. And our efforts will not stop at aiding those affected, once that important task is accomplished we will unite again to help prevent this from happening again! The disheartening aspect of this whole fire is that in the face of adversity, there is no central coordinating agency to manage relief funds. Personally, my wife and I have thought about donating money, as well as time (in the form of professional temporary services to children in the area with disabilities), but there is no assurance that the money (or our desire to help) will be received. Some of you may have seen reports of individuals who wanted to donate money and supplies, but they did not have an appropriate liaison. Please note that I want to help, but, having grown up and spent large parts of my youth in Greece, I am suspicious. I just want the money that I give to help those affected by the fires. On another note, does anyone know of any schools or agencies for children with disabilities which were affected? I would stick with the Greek Red Cross which is pretty well organized, the Orthodox Christian Charities out of Baltimore which has an excellent track record, or the Greek Archdiocese of American which has set up a fund. AHEPA is "iffy" at the national level and I would stay away from giving to the national. They have a history of embezzlements and a very very high overhead tacked on generally.they still do not publish data on overheads applied to their other charity funds. They have no infrastucture at all in Greece so they are at best going to give to the Geek Red, in which case you would be better off sending money directly to the Greek red Cross. Everyone has an opinion and is always welcomed to express them. However, when claiming to state something as truth, be sure to be ready to support it with facts. Well if he had, then AHEPA would most certainly be on the top of his list. What about the millions of dollars given, per year, to aspiring students across the country, to subsidize housing for our poor and elderly or given annually to the Ecumenical Patriarchate? After the Athens earthquake in 1999, AHEPA raised $200,000 for the people of Greece, which was promptly handed over to the Hellenic Red Cross, via the American Red Cross. However, it took a total of seven (7) years for the funds to finally be disbursed. Can a US Citizen donate/contribute money to a foreign entity/corporation/organization and get a tax deduction on their US Tax Return? Again, if you are going to claim something as a truth, be sure to have the facts to support your argument. Why? Because of the embezzlement that happened in 1994. Doesn’t Mr. Kostas remember that the two people involved went to prison? Maybe Mr. Anonymous has a selective memory. The Archdiocese, IOCC, AHEPA…, and many others are giving. In the end, whatever you decide, be sure to give and give generously. Let’s not forget who we are trying to help. Not knowing how others will distribute monies collected - after reading what is posted on AHEPA’s Web site and calling AHEPA Headquarters for clarification - they will donate 100% of the tax-deductible contributions that are collected directly to the people of Greece. If Mr. Kostas has concerns, maybe a visit to AHEPA’s Web site or a call to AHEPA Headquarters will set the record straight. Regarding AHEPA in HELLAS there is a tremendous infrastructre with not 1,2 or 3 chapters but 11 and still growing. The care packages which we received last month were trucked by volunteers to Kalamata warehouse and distristbuted. Go to www.ahepahellas.gr and view videos.